“As the meeting concluded, Milinda said that the PM was glad to hear our views, that he heard a lot of views, including Milinda’s own, as well as those of other Ministers. In the end, however, only the PM could make the decision. It was his government and his political future. The Ambassador replied that we understood completely that it was his country, his issue, and needed his solution. Moragoda asked that the Ambassador convey to Assistant Secretary Rocca that her comments to Ambassador Subasinghe had been heard.” the US Embassy Colombo informed Washington. The Colombo Telegraph found the related leaked cable from the WikiLeaks database. 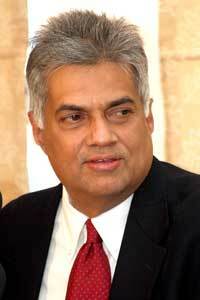 The classified diplomatic cable details a meeting the US ambassador had with then Prime Minister Ranil Wickremesinghe. The “Confidential” is cable signed by the US Ambassador to Colombo Jeffrey J. Lunstead on January 12, 2004. DEPARTMENT FOR D, SA, SA/INS, INR/NESA; NSC FOR E.
(U) Classified by Ambassador Jeffrey J. Lunstead. Provinces, then they could do so in the Center also. Opposition, so that the JVP could not claim that role. the challenge now was to find a way forward. constituting separate theater commands still in play? CFA, and take it over. was an answer in there. respect, she also had to treat them properly. meeting in Washington. Discussion in Septel. comments to Ambassador Subasinghe had been heard. for a lot of the time "Roosevelt just did nothing." SL must copy US spying and spy on Tamilians.